THE PET WORLD'S BEST KEPT SECRET! Rats are the best kept secret in the world of pets. And the secret is what excellent companion animals they can be! Most people unfortunately think of rats in terms of the sewer rats everyone has seen in the big cities. These animals are not cute and cuddly - they can't afford to be, in the environment they live in. It's like thinking all dogs look and act like coyotes. The domesticated rats we keep as pets are as different from their sewer-dwelling relatives as they can be. This is a picture of my first rat, Molly. I got her from the local shelter (where I have gotten the vast majority of my rats). I had not had any experience at all with rats, but at the shelter I was able to watch her interact with people and became very interested. I decided to take a chance and adopt her, and it turned out to be quite a momentous decision, in many different ways. Molly was one of the sweetest, most lovable rats I've ever had. It was through her I first became aware of the enormous potential rats have for being delightful pets. An amazing characteristic of rats is that they love to be handled. In fact, they need to be handled by their human companions, they look forward to it, and they miss being handled if they are deprived for a long time. They form deep, affectionate bonds with their owners, and Molly would always lick my hands and fingers up and down while I was playing with her. Energetic and insatiably curious about everything, rats love nothing more than to explore their immediate area in the company of their owner. Molly even got jealous of my other pets, when I was playing with her and they came around to see what was going on, and would vigorously chase them away. She would not tolerate any infringement on her quality time. A few weeks after I got Molly, she fell off a table and broke her hind leg. It was on a Sunday night before the Fourth of July, so I took her to the emergency animal clinic nearby. There the veterinarian examined her, confirmed her leg was broken and casually suggested I have her leg amputated. "They get along very well without their leg," he said. I was quite appalled by his blithe suggestion, and quickly left. Several days later I took her to the North Central Animal Hospital, where the very skillful Dr. Hillary Frank put a small pin in her leg and put her in a cast. Molly had to stay in her cast for more than a month, and she chewed it off several times, but eventually she made a complete recovery. About six months later I had to make the painful decision to put Molly to sleep, after it was discovered she had a tumor tangled up in her urinary system and that surgery would be very risky and might not be effective. So I had to say goodbye to my first pet rat, but she was going to be the first among many to follow. My next rat would be a beautiful blue rat named "Belle", of whom I unfortunately do not have a photo. Her breed was a "blue" rat, but of course she wasn't really blue, she was a gorgeous charcoal gray color with beautiful black eyes. Belle was quite a handful when she was young. I bought her as a companion for Molly, but Molly would have nothing to do with her. Belle would always act like she was afraid of me, running swiftly away whenever I would approach her. But I noticed when I turned around and left the room, Belle would always run over as far as she could to look for me. Eventually she calmed down and became an absolutely wonderful rat, very loving, affectionate and playful. She was quite beautiful and was admittedly my favorite. 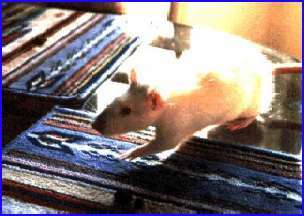 She died in December 2000 after a long (for a rat) life. The only downside I can see to owning a rat as a pet is that their normal lifespan is only 2 or 3 years, much too short for such an interesting, intelligent creature. Sometimes I will hear of rats living to be 4 or 5 years, but that is exceptional.